Nobel Prize laureate Peter Agre '70 announced that he is taking a leave of absence from his Duke University position this summer to consider entering the U.S. Senate race in Minnesota. He would challenge Republican Norm Coleman as he seeks reelection in 2008. Agre was born in Northfield, Minn., graduated from Roosevelt High School in Minneapolis, and earned a bachelor's degree in chemistry at Augsburg in 1970. His father, Courtland Agre, taught chemistry at St. Olaf College until 1959, when he joined Augsburg’s faculty until his retirement in 1976. Peter Agre chose to pursue a medical career, and during his last year at Johns Hopkins University School of Medicine, he began to gravitate toward research. After a medical residency at Case Western Reserve and a clinical fellowship at University of North Carolina, Agre returned to Johns Hopkins for research in cell biology and eventually joined their faculty, where he stayed until 2005. His research there to discover "aquaporins," or proteins that allow passage of water across cell membranes led to his recognition by the Nobel Institute. In 2003, Agre and Roderick MacKinnon were awarded the Nobel Prize in Chemistry. Agre has used his public forum to lecture and advocate for science education and academic freedom. In his Nobel remarks, he said, " … the need for scientific understanding by the public has never been larger, and the penalty for scientific illiteracy never harsher." He is also committed to seeking changes to the national healthcare system. Agre is currently vice chancellor for science and technology and professor of cell biology at Duke University Medical Center. This summer, he plans to establish residency in Minnesota and evaluate a run for the U.S. Senate, which has never had a Nobel science winner. 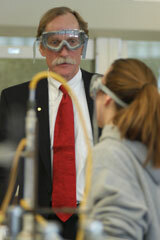 Photo: Agre meets with a current Auggie chemistry student.